The process is simple at first, there are about 20 exterior screws to remove. Taking off the casing is the first problem, the nozzle cover is attached to the casing somehow, partly glued and partly attached to the mechanism that changes the size of the water stream. So, a little brute force is needed. After wincing at the sound of my expensive water weapon cracking and snapping, I had it off. Sigh, the pressure chamber is screwed together with 9 more screws, nice long ones. 15 minutes later I was looking at the heart of the CSP line. 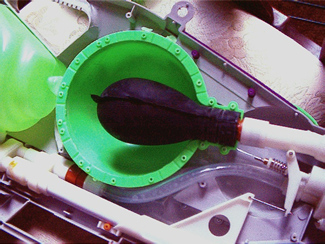 A thick, bulb shaped piece of rubber with a cylindrical piece of plastic in the opening. The plastic piece has two o-rings on it to seal with the rest of the flow mechanism. Quite simple really and not as prone to breakage as people might think. The rubber is very thick and heavy and I doubt it would break unless under great duress or with extreme age. The rest of the gun is quite simple and ressembles other simpler weapons I have taken apart. The two parts that look most likely to break are: A. The nozzle assembly, which I have had problems with in the past. The wire mesh inside slips away too easily. B. 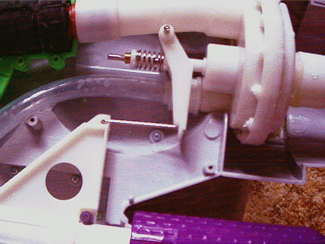 A tear shaped plastic assembly near the nozzle that is supposed to be sealed and from inspection seems to be where most of the pressure occurs while pumping. The air and water pass through here under a good amount of pressure. The plastic bit described in B. is where my problem occurred. The sealant used had given way while the blaster was fully pressurized. Hence, it let out a bang when it gave out. I merely have to buy a good sealant and re-seal it. 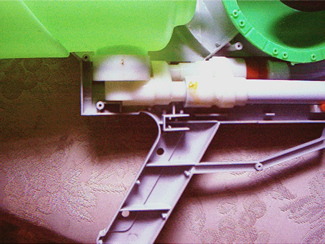 From the water tank there is one plastic hose that merges with where the air is forced in while pumping, the two combine and then pass through the tear-shaped plastic assembly and into the rubber pressure tank. When the trigger is pulled a valve opens and the pressurised water shoots out. ...or so I assume. Simple. If anyone knows better, please drop me a line. Ok, that's it, I think. If you want any more info, I can probably provide it.I tried using epoxy resin to seal it (worked once on another gun), but it isnt water tight enough and I think the high pressure will bust it. So, onto an expensive sealant. Sigh. Keep you posted. Images Used with Permission from Shane D.